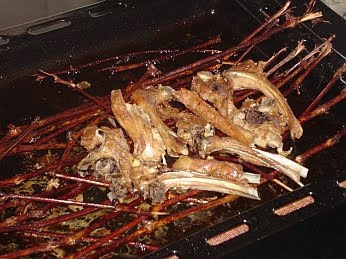 This is a traditional way of preparing lamb ribs using the stalks from vines as a kind of grill. 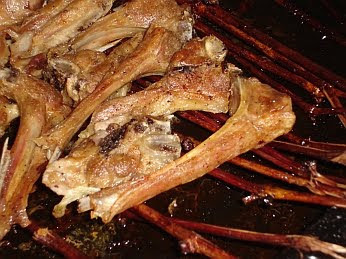 The ribs take the aroma and flavour from the vine stalks. Also, instead of using normal brushes to apply the juice, bunches of dried oregano are used, which again adds another subtle flavour to the ribs. They can be eaten with pilau rice or salad. Cut the vine stalks into lengths that can fit across a shallow oven dish, balancing on the edges. Add salt and pepper to the ribs and 50 ml of olive oil. Beat the remaining 100 ml of oil well with the lemon juice. Place the vine stalks across the oven dish. Place the ribs on top of them. Place in a pre-heated oven at 200 degrees Celsius for 20 minutes. Remove from the oven and brush them with the oil / lemon mixture using the oregano ‘brushes’. Put back in the oven for another 15 minutes in order to get a nice colour. Remove, brush again, turn over, brush on the other side and put back in the oven for another 15 minutes. Remove, brush and put back in the oven for 15 minutes to get a nice colour. Remove from the oven and place the ribs on a platter, brushing with any remaining oil / lemon mixture. These sound so good. It's funny because we, my Mom and I would always use oregano brushes for basting our meats.